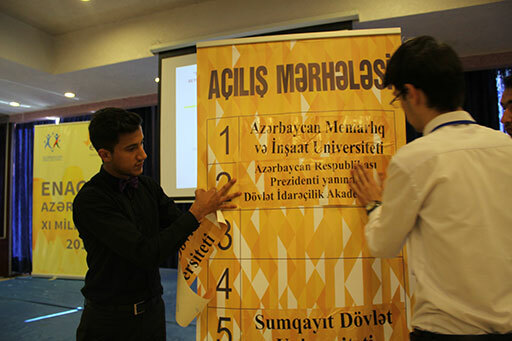 Our ninth national competition takes us to Baku for the Enactus Azerbaijan National Competition. 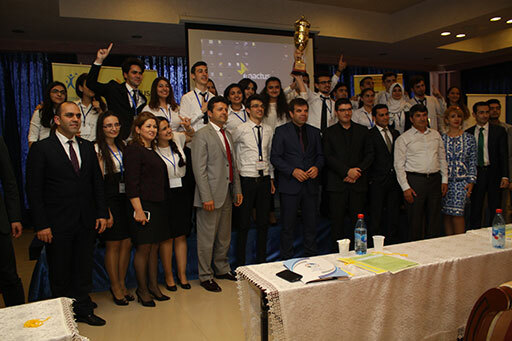 On 26 and 27 May, 320 student, faculty and business leaders came together at the Monolit Plaza Hotel for two days of competition, collaboration and celebration. The event kicked off with the introduction of the teams followed by a series of engaging speakers including Sulheddin Gozalov, Head of the Department of Science and Higher Education Ministry of Education of Azerbaijan Republic; Elshan Asadov, Head of Department of Regional Development and State Programs of Ministry of Economy of Azerbaijan Republic; Salchuq Duzgun, Executive Director of TUSİAB Society; and Sanan Hasanov, Head of Business Development Department of CDB Banks OJSC. Next up, the exciting opening round of competition, which saw 12 teams compete to earn a spot in the final round, decided by 24 executives serving as judges. In the spirit of learning and supporting their peers, six teams attended the event to observe the competition, which gave them the unique opportunity to brainstorm ideas for their own communities and discuss them with others. Finally, it was time for the final five teams to take to the main stage, where they inspired attendees with the impact they have made this year. 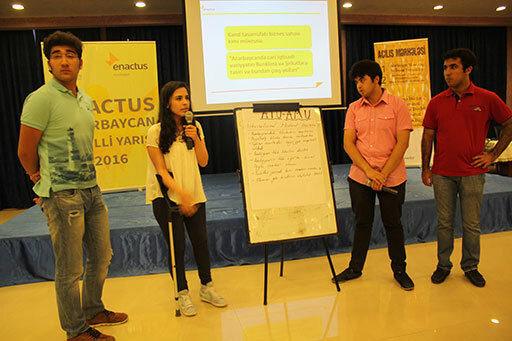 Judges had a difficult task selecting the champion but in the end, the trophy was presented to the team from Academy of Public Administration who will now go on to represent their country in the Enactus World Cup in September. One of the projects they presented was My Chicks, which engages low-income families in rural areas and helps them set up a family poultry business by converting old refrigerators into incubators. 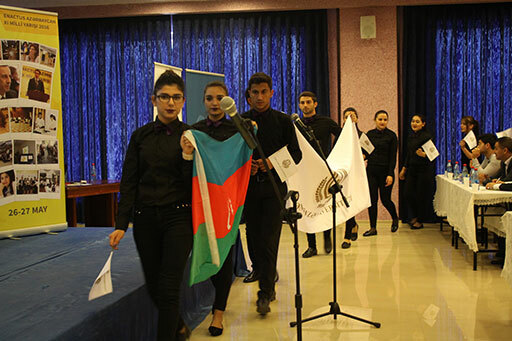 Generously supported by Youth Foundation under the President of the Republic of Azerbaijan, Ministry of Education of the Republic of Azerbaijan, Azerfon LLC, and AGBank OJSC, CDB Bank OJSC, and TUSIAB Society, the event was covered by numerous media outlets including this great article. Numerous special guests made time to attend including representatives from the Ministry of Education of the Republic of Azerbaijan and the Ministry of Agriculture, as well as executives from Azpromo, Azerfon LLC, AGBank OJSC, CDB Bank OJSC, and TUSIAB Society. 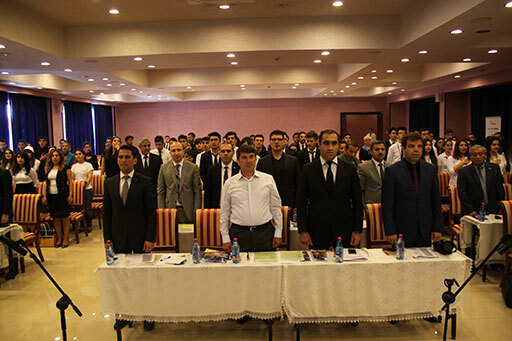 Vusal Guliyev, Head of the Sector for work with youth organizations under the Azerbaijani Presidential Administration’s Social and Political Department was one of those guests. 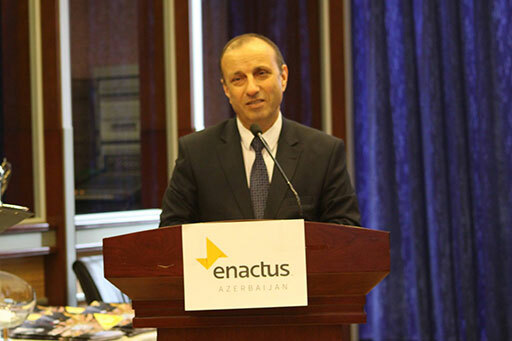 He presented the awards at the final ceremony and shared with all delegates how important the Enactus program is for the country by giving students a forum to implement their ideas to raise the standard of living of others through the power of entrepreneurship. 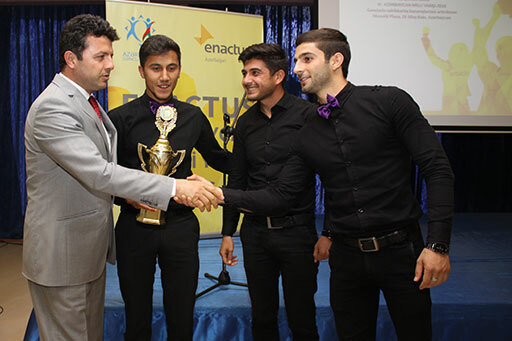 Want more highlights from the Enactus Azerbaijan National Competition? There’s lots to see on social media, thanks to the hard work of the staff and the country’s social ambassador. Check out their Instagram feed here and Aytakin Badalova’s Facebook page, one of the ambassadors! And don’t miss this great flashback video!